WASHINGTON (CNN) -- As Democrats continue to splinter over President Obama's proposed health care reform plan, Republicans are taking the opportunity to home in on a key argument: A good bill deserves more time and deliberation. Sen. James Inhofe, R-Oklahoma, says his party may have enough votes to stall Democratic health care reform. Rep. Nathan Deal, R-Georgia, said Friday that Obama's rush to put a bill together is "totally irresponsible." "Most of us believe that the decision as to major reform of how Americans get their health care in this country deserves at least as much time and deliberation as it would take to select a puppy to live in the White House," he said. "It took the president six months to decide how long and which puppy he was going to have. ... To expect Congress to do something on major health care reform in six days is totally irresponsible." Sen. James Inhofe, R-Oklahoma, speaking on conservative Hugh Hewitt's radio show recently, was asked about whether his party had enough votes to block health care from going forward. His answer: "I think so. I really do." "If he is unsuccessful, which I anticipate and will predict he is, on getting a vote prior to the August recess, then I would say there's no way in the world they're going to get this done this year," he added. Obama's fight to get health care reform through Congress hit a major snag this week -- facing opposition from Republicans and fiscally conservative "Blue Dog" Democrats worried over the costs -- estimated to be around $1 trillion. Rep. Joe Barton, R-Texas responded to Democratic criticism that the GOP has failed to present a viable plan. "When the Democrats say we don't have a plan ... where's their plan? If they can't get a bill out of committee, where's their plan?" he said. Rep. Roy Blunt, R-Missouri, said it's hard to combat the Democrats' proposed legislation when it changes "by 100 pages every time you walk into the room." The GOP's fight is also getting political, namely looking ahead to the upcoming midterm election. "I just hope the president keeps talking about it, keeps trying to rush it through. We can stall it. 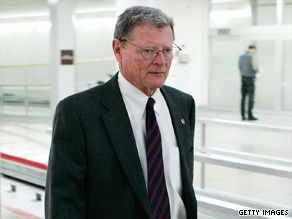 And that's going to be a huge gain for those of us who want to turn this thing over in the 2010 election," Inhofe said. Last week, Sen. Jim DeMint, R-South Carolina, was quoted as telling the group Conservatives for Patients' Rights, which opposes Obama's health care plan, that "if we're able to stop Obama on this, it will be his Waterloo. It will break him." Obama debunked DeMint's claim during a live prime time news conference Wednesday night at the White House. Obama's chief-of-staff, Rahm Emanuel, took a swipe at the GOP's political maneuvering. "At least they're honest about their motivation," Emanuel told National Public Radio Friday. "Their view about health care is about defeating President Obama. Politically, I actually appreciate what they said."